Single domain protein with poorly structured termini and loops. Structurally variable regions were removed from NMR models for evaluation of predictions. OB-fold. 5-stranded β-barrel, partly open between the 3rd and the 5th β-strands. The five strands are shown in the ribbon diagram below as dark blue, cyan-green, lime-green, yellow and orange. In addition to the 5-stranded OB-core, this structure is elaborated with the long insertion between β-strands 1 and 2 housing an α-helix, and a C-terminal α-helix. Fold recognition. Fold similarity not detectable statistically by sequence methods known to us. According to structure, proteins from 'Nucleic acid - binding' superfamily are also most similar to T0467, and those include phage ssDNA - binding proteins with an open barrel. NMR models contain the C-terminal His-tag residues 98-LEHHHHHH-105, not present in the target sequence. This regions was removed from NMR models due to disorder anyway. DUF1093 in Pfam, which includes just a few very close homologs. 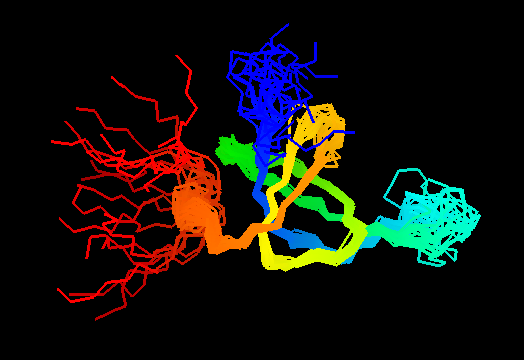 Below is PROMALS3D alignment of several most distant homologs detectable by PSI-BLAST. This alignment was not edited manually and may have errors. Biological sequences contain signal peptide (predicted as a helix at the N-terminus) not included in the target sequence. This OB-fold was predicted de-novo by ROSETTA, which correctly indicated an open barrel. This prediction was very suggestive of the correct structure, because ROSETTA is biased towards local β-strand pairing, and OB-fold has a crossing loop to form H-bonds between β-strands 1 and 4, not to mention barrel closure present in most OB-folds with H-bonds between β-strands 3 and 5. Metaserver bioinfo.pl fails to find similarity to other OB-fold proteins, and incorrectly provides SH3-like predictions. Although some servers used OB-folds as templates, it is unclear how significant those predictions are, as the templates were closed barrels and many severs used SH3-fold templates as well. The bias towards SH3 fold is likely caused by the C-terminal region, which shows strong local conformational similarity to Sso7d Chromo-domain DNA-binding proteins. This similarity covers about 30 residues (half of Sso7d SH3-fold) and spans through a β-hairpin and two α-helices. The first helix is a single-turn helix characteristic of SH3 fold. Such a helix frequently structured as a 310-helix is present at this spatial location in the majority of SH3 fold proteins. Mutual orientations of the four secondary structural elements between the two fragments (from OB and SH3) is very similar, and sequence similarity reflects this. DALI-LITE does not see this local similarity, but aligns the central 3-stranded meander β-sheet in two proteins (shown in the back on the images above: blue-cyan-green in T0467, and green-yellow in Sso7d), albeit with a very low Z-score of 0.3 (33 residues, RMSD 2Å). We agree that this is a globally meaningful alignment (only residues in capital letters are aligned), as it superimposes hydrophobic cores of both proteins. As a summary, superposition of locally similar fragments does not result in a global superpositions of structural cores of the two folds, and does not result in a reasonable fold prediction. Vice versa, global superposition of the cores leaves the two locally similar fragments as non-equivalent parts of the two proteins, as they occupy very different spatial locations and carry out different structural roles. Global similarity between OB and SH3 folds has been noticed previously1), and explained in terms of very distant evolutionary relationship (homology). It is possible that the two folds shared a common ancestor and are indeed homologous over the 3-stranded curved meander sheet, although definitive evidence for this is lacking. The meaning of the local fragment similarity between T0467 and Sso7d-like chromo-domain OB-fold proteins is unclear. It is conceivable that these similar fragments originated independently and conformational resemblance between them is due to chance. First models for T0467: Gaussian kernel density estimation for GDT-TS scores of the first server models, plotted at various bandwidths (=standard deviations). The GDT-TS scores are shown as a spectrum along the horizontal axis: each bar represents first server model. The bars are colored green, gray and black for top 10, bottom 25% and the rest of servers. The family of curves with varying bandwidth is shown. Bandwidth varies from 0.3 to 8.2 GDT-TS % units with a step of 0.1, which corresponds to the color ramp from magenta through blue to cyan. Thicker curves: red, yellow-framed brown and black, correspond to bandwidths 1, 2 and 4 respectively.